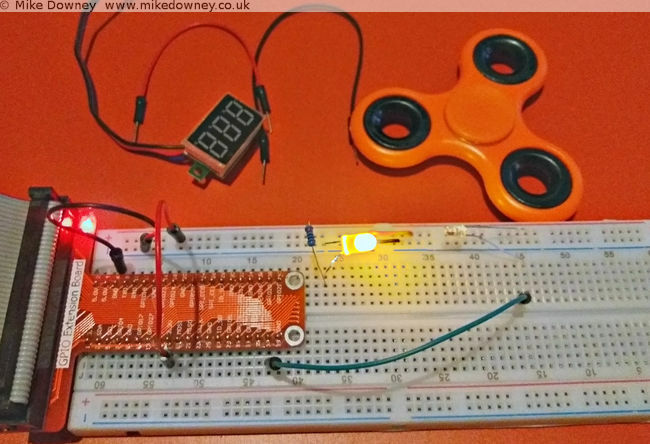 Raspberry Pi + LED + Photodiode + Fidget Spinner - Food, Drink, Photography, and other things. In the early 90s I wrote a Mandelbrot Set generator in 68000 assembly language on the Atari ST. 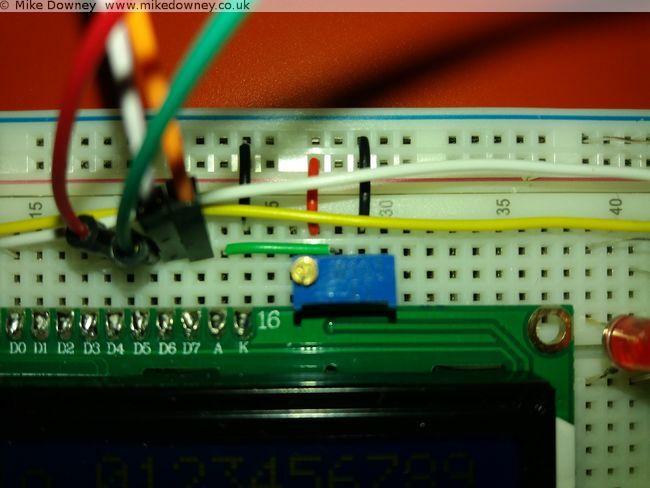 The 68000 processor didn't have any floating point arithmetic so I wrote a set of fixed point arithmetic routines with precision ranging from 16bit, 24bit and 32bit. These all had 8 bits for the integer with the remaining holding the fraction part. I managed to find a copy of the program and got it to load in an emulator. 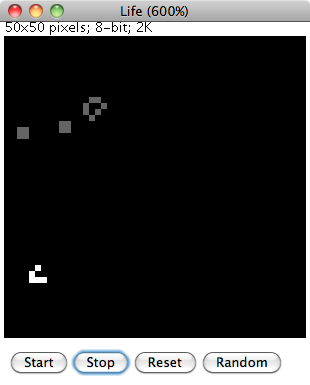 The Atari takes around 10 seconds to draw, and only uses a 200x200 window. A couple of years ago, I wrote a Java version which works as an ImageJ plugin. This version is much faster (0.07s for a 800x600 image), which works out as 1700x faster than the Atari, despite only being clocked 300x faster. Processor design improvements and hardware floating point probably account for much of this increase. 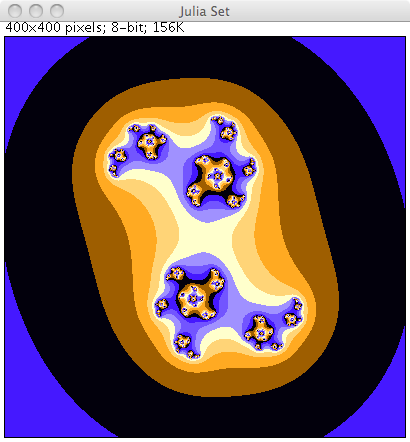 A couple of years ago I wrote an ImageJ plugin to draw the Mandelbrot Set. I recently updated it to make animations (download available here). The images will be saved in the folder given in the 'out' variable. Although this can be accomplished using the 'Combine' option in the ImageJ stack menu, the script works with virtual stacks so can handle much longer animations. Here is the ImageJ version of the classic Game of Life which I wrote in an evening, several years ago. I have made a small change since then so the 'Reset' button clears the window and the 'Random' button fills the window with random dots. The ImageJ drawing tools can be used to fill in pixels. Clicking on 'Start' will begin the animation. Pixels which have remained unchanged slowly fade to grey while pixels which 'came alive' are in white. Download the source code and load into ImageJ or Fiji. Select 'Compile and Run' to start. 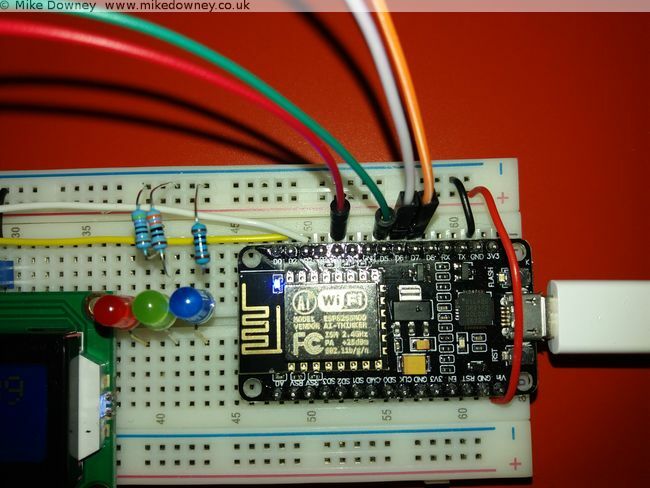 The program was cobbled together fairly quickly and ideally would need a bit more work to make it more user-friendly. Any configuration is done by editing the source code and recompiling. The speed of the animation can be changed by altering the value of 'pause' (value in milliseconds). The size of the world is given by the 'width' and 'height' variables. If these are changed then the image window may need to be resized by changing the default magnification in the setMagnification() command. A few weeks ago I was reading the book The Emperors New Mind by Rodger Penrose and I reached the part where he discusses the Mandelbrot Set. Years ago I used to enjoy exploring this on my computer. 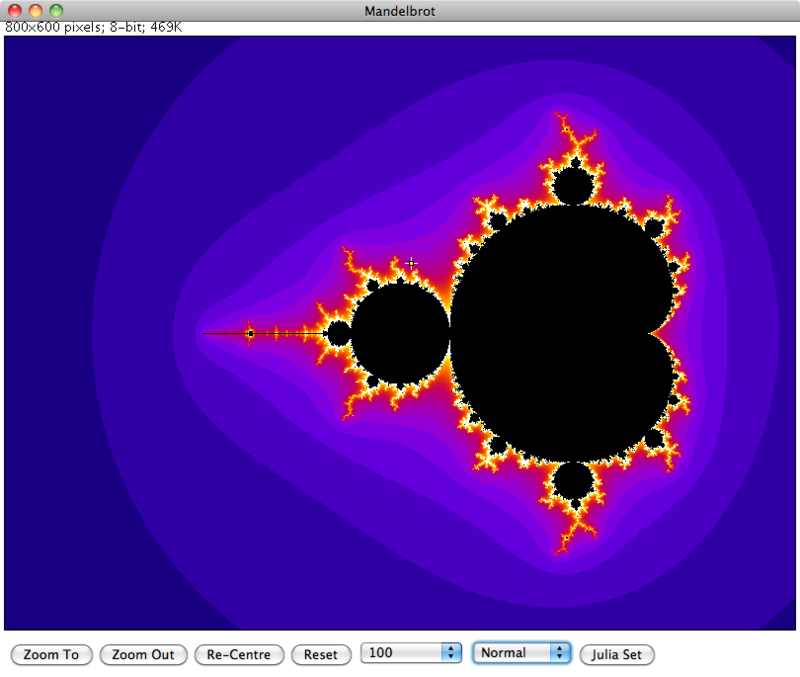 I decided to download a mandelbrot program for my mac but couldn't really find one which I liked. This prompted me to have a go at writing one myself. I decided to cheat a little and write it as an ImageJ plugin so I didn't have to handle the display and mouse myself. 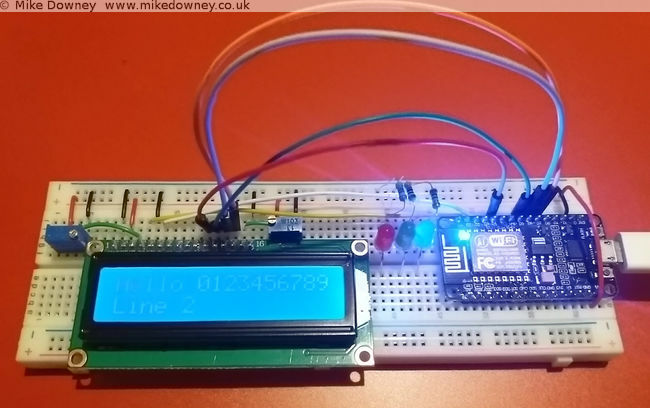 I reused some bits of code from a version of Life which I wrote a few years ago and also some code which I developed during my PhD and managed to get a useable plugin up and running that evening. Over the next few days I added a few extra features and made it a bit more useable. Click on the download link and save the 'jar' file into the ImageJ or Fiji plugins directory. Select 'Mandelbrot' from the 'Plugins' menu. Configuration options are in the 'About Plugins' submenu of the 'Help' menu. After changing any options, the mandelbrot set window will need to be closed and the plugin re-run before any changes will come into effect. To zoom in or out, use the 'Point' tool of ImageJ to select the new centre and click on either the 'Zoom To' or 'Zoom Out' buttons at the bottom of the window. To pan the view without changing the zoom, select the new centre then click on the 'Re-Centre' button. The 'Reset' button returns the view back to the original zoom. 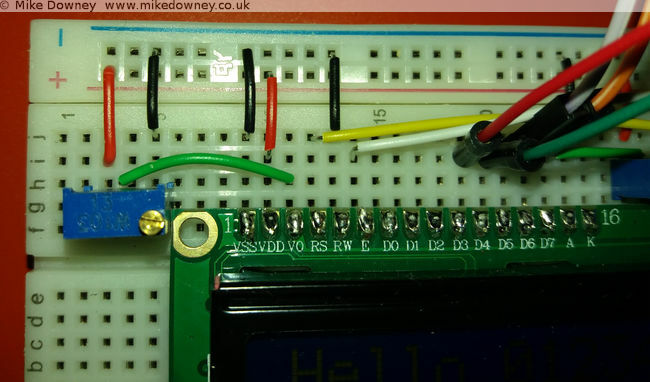 The number selection box to the right of 'Reset' controls how many calculations are performed before the algorithm decides whether a point belongs to the set or not. Increasing this number will show more detail at the fringes of the set at higher zoom levels. The Normal/Sqrt/Log selection controls how the colour values are calculated. Initially all values are displayed in greyscale. To display in colour, select one of the ImageJ lookup tables for the required colour scheme. Finally the Julia Set for a particular point can be displayed by selecting a point then clicking on the 'Julia Set' button. Further details on the Mandelbrot Set and Julia set can be found in Wikipedia. I was discussing nursery rhymes and similar childrens songs with Emma and we were talking about how we learned slightly different versions of some songs. Neither of us could remember the full words to the song I'm a little teapot so I decided to look them up. Our tablet computer was nearby so I used that, clicking on the voice search and saying the name of the song. I was a little surprised by some of the suggestions and had to search the old fashioned way, by typing the words instead. When I tried the search using my phone, it correctly recognized what I was saying. I really have no idea what the computer thought I was saying. Last year, Emma bought an Advent Vega tablet computer. It uses the same 'Android' operating system as many mobile phones but of course with a much larger screen. The only real problem with the Vega is that out of the box, it doesn't support the Android Market, which makes it a bit difficult to install applications. We installed an updated version of the software which makes the tablet much more useful. Without the Android Market, you are more or less restricted to web browsing and the built-in applications. After playing around with it for a few weeks, the tablet ended up in the bottom of a drawer for a few months, unused and ignored. We both had new HTC phones which came with Android, so we could do all the same things on our phones, which also had the advantage of being smaller and more portable. I recently decided that it would be a good idea to get the tablet up and running again. The main idea was so it could be used to read recipes in the kitchen, to save having to either print out from websites or try to use a laptop in the kitchen. So far I haven't actually used the tablet in the kitchen but it is getting used fairly regularly now. I don't find it as convenient for web browsing as a full laptop because it is a bit slower and the lack of a full keyboard makes it less useful for using forums etc, but it is perfectly fine for reading ordinary web pages. We have installed a few applications which get fairly regular use. The one I probably use the most is the Kindle app, which turns the tablet into something very similar to an actual Kindle. You can download books from the Amazon website or install them from elsewhere (such as Project Gutenberg). So far I have read a few freely available, out of copyright, books. I had never read any Charles Dickens books or any of the Sherlock Holmes novels so I decided to give them a go. I decided to start with A Christmas Carol (since it was Christmas at the time), then moved on to The Adventures of Sherlock Holmes and The Hound of the Baskervilles. I am now reading the ebook version of God's Debris, by Scott Adams. I find reading ebooks or PDFs on the tablet is much easier than on a laptop. The device is much lighter, and the screen is a better shape and size. I have several books queued up ready to read next, including Gulliver's Travels, which I actually downloaded when we first got the tablet but I didn't get around to reading it. In the last few years, I haven't read as many books as I used to. In the run up to Christmas, I decided that I would spend a bit less time on-line and more time reading, and so far I have been fairly successful. I probably won't be able to keep the pace up and read a book a week but I should be able to catch up on some of the books which I have had for a while but not read yet. I suspect the problem was caused because I was at home but sending an email from my work account, which by default tries to connect to a particular email server. This server is configured to only accept connections from on-site. When a backup drive is shared between people, the Time Machine/Time Capsule backup system uses what's known as a 'Sparse Bundle' to simulate individual drives for each person. 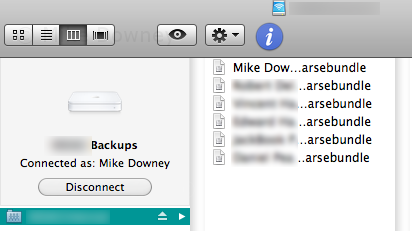 Unfortunate choice of name when the directory window isn't wide enough to display the full filenames.